Every year since 1989, the United Nations General Assembly has organized an International Day of Disaster Reduction to promote a global culture of natural disaster prevention, mitigation, and preparedness. 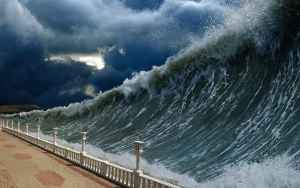 Science and technology has come incredibly far with their ability to predict weather and disaster phenomenon in the last few years alone, helping warn us when and where a large, possibly destructive storm may occur. However, even meteorology has its limits. That’s why this year’s focus for the IDDR is on the natural indicators all around us of impending disasters. Some events can never be accurately forecast, but here are some signs from the environment everyone should know and recognize in case of an emergency. While there are no real warning signs of a wildfire about to start, there are certain contributing factors that make it much more likely for a spark to catch. Intense heat, hot, dry wind, and a lack of recent rainfall or moisture in the area can greatly increase the chance of a wildfire occurring. During a fire, of course, you will be able to see and often smell the smoke. If you’re standing at a distance, look out for any wildlife that might be running in your direction and pay attention to whether the wind is blowing towards you. This could mean you’re standing in the fire’s path and need to evacuate immediately. Floods are extremely common following a large storm or as ice begins to melt in spring. Water levels will begin to rise dramatically in streams, rivers, and lakes and will usually turn brown and muddy from sudden erosion. In the case of flash floods, you will be able to hear the roar of rushing water before you see the flow, so make your way to higher ground as soon as possible to avoid being swept away. Tornadoes are one of the easiest natural disasters to spot in advance – which is why you’ll usually see a whole train of storm chasers racing after them almost as soon as they form. Dark clouds will gather in the sky, creating an eerie “wall cloud” that can form up to half an hour before the tornado’s funnel. 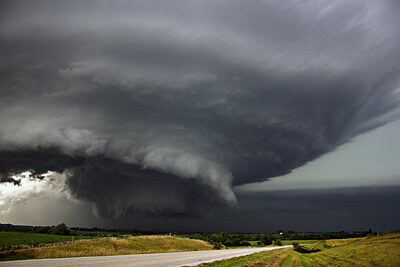 Strong winds and intense weather such as heavy rain and hail also occur in the buildup to a twister. 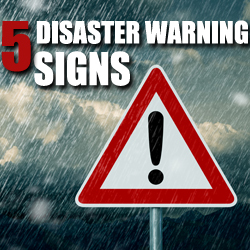 If you see these natural signs, make your way to a cellar, if you have one, or away from windows and open spaces. Earthquakes are a bit harder to predict, although there are some telling features. If you’re near a pond or a well, you might notice a significant increase or decrease in the water’s level, which may also turn muddy or start to bubble. Rivers and streams may react similarly or the water could suddenly change direction. These symptoms could happen as early as half an hour before the shaking begins, but they are also fairly rare to notice. Similarly, animals have also been known to sense when an earthquake is about to take place, but only by a few seconds so it doesn’t do you much good in the way of a warning system. With an earthquake, the closest you can get to a reliable natural warning is other, smaller earthquakes known as pre-shocks. earthquakes that take place along shorelines or out at sea. Usually the earthquake will have to last longer than 20 seconds to cause a tsunami, but at least you won’t miss the warning! Another tell of a possible tsunami getting ready to strike is receding water along the coast. As the wave builds up at sea, the waterline will begin to retreat several minutes in advance to maintain equilibrium. While this doesn’t happen in every circumstance, it’s a fairly reliable sign that you should get to higher ground immediately. Despite nature usually trying to kill us as often and in as many creative ways as possible, knowing how to read its poker face can help you escape many stick situations. For more information on local, traditional, and cultural ways to predict natural disasters, visit the UN’s International Day of Disaster Reduction website. And when disaster does strike, give us a call and let us help you get a Fresh Start.